Adapt and Overcome! 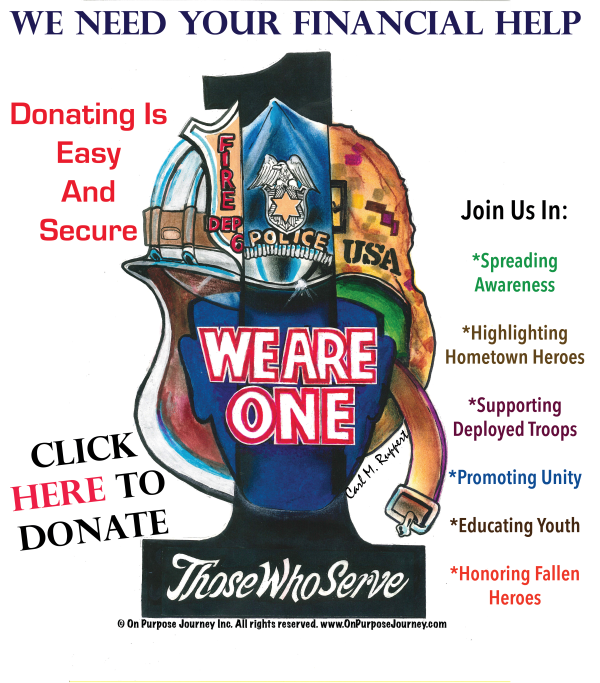 On Purpose Journey Inc. had to make some unexpected changes to our 9/11 Tribute Events this year, so we will not be hosting BOOKS FOR BRAVERY or STANDING FOR THE FALLEN Tribute Events as we did in the past with various fire/law enforcement/military departments! However, we will not forget! We will deliver 9/11 messages of awareness, unity, and gratitude to honor the heroes that selflessly rallied for our safety 16 years ago and still do today. All donations received from our amazing sponsors and donors so far will be used to fill and ship care packages overseas to our deployed troops, as we just had a firefighter/Marine/Seabee and crew deploy along with another military service member from Wisconsin who was a friend of our buddy who was killed in action 11 years ago, so we have a 9/9/17 Care Package & Appreciation Event now planned. We also are hosting an online 9/11/17 International STAND Team where we will honor our fallen heroes with support from around the world on 9/11/17. Some things we cannot control, but we will continue to Stand With Those Who Serve and Stand For The Fallen. We are able to continue our work due to numerous volunteers and amazing donors!! IN-KIND: Best Place at the Historic Past Brewery, Cabela’s, Chocolate Factory (Cedarburg), Costco, Darin Dubinsky, Gigi’s Cupcakes, Greenfield Fire Department, Home Depot (Grafton), Jennifer Klemens, Kristina Collection, Lyndsey Kuhlmann, Law Enforcement Lifestyle (Coeur d’Alene, ID), Lea Salter, Madison Rising, Ma Fischer’s Restaurant, Mollie Manhattan, Milwaukee Fire Department, Nino’s Italian Bakery, Scott Smith, Starbucks, Laura Vanderbilt, Tito’s Handmade Vodka, and Walmart (Hartford). Partners for 2017 (so far…): Biloxi Fire Department, Paul Enhelder, Greenfield Fire Department, Brett Hill and the 9/11 Patch Project, Hoover Alabama Fire Department, Iowa City Police Department, Kenny Matlock, Menomonee Falls Fire Department, Milwaukee Fire Department Honor Guard, North Shore Fire Department, Matt Scovill, Ozaukee County Sheriff’s Office, Rock Hill South Carolina Fire Department, Sheboygan Police Department, Ivan Soto, Cameron Stewart, Clebe Stutes, Thiensville Fire Department, John Wetzel, and the Wilmington Delaware Fire Department.